Threaded Thermowells - TC Ltd.
Click here for a short animation explaining how these thermowell products are used with other products. with male and female threaded connections. Parallel sheath. with male and female threaded connections. ﻿Socket Weld style. Machined from solid thermowell, designed to work with socket weld fittings. Tapered, parallel or stepped sheath. 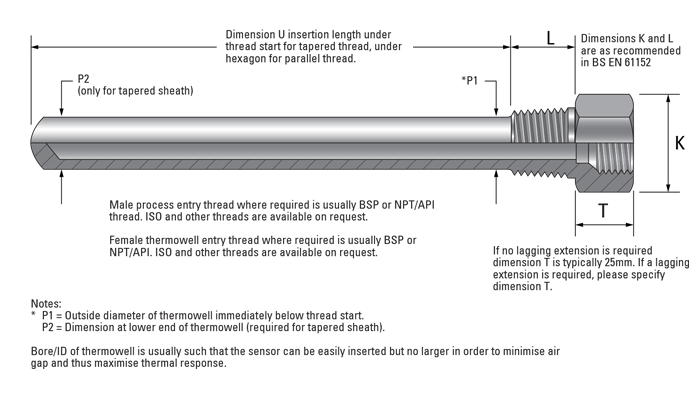 for a welded thermowell, process connection is usually BSPT and sensor connection is usually BSPP.